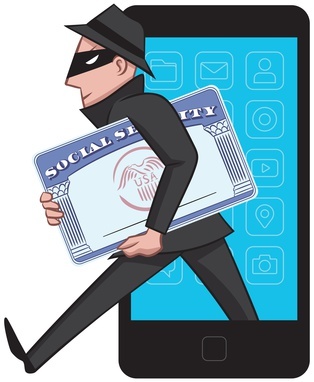 Although identity thieves target people of any age, criminals often target those who receive Social Security retirement and disability benefits or other government benefits. Older and disabled individuals are more likely to expect phone calls from the Social Security Administration. They're also more likely to rely on Caller ID to confirm the identity of a caller. Of course, scammers have found ways to impersonate representatives of the SSA successfully. As a result, it's important that you use this guide to help lower your risk of becoming a victim of identity theft and fraud. Identity thieves use a variety of modern technologies to mask their phone numbers so that real SSA phone numbers show up on Caller ID. They also invest a lot of time into researching the names and numbers of real SSA representatives. They know that most people who answer a ringing telephone are often distracted by other things and can fall prey to this tactic coupled with helpful callback and intimidation tactics. For example, they might claim that they're calling to help you complete a disability application or threaten to end benefits. In both scenarios, they only need you to confirm some personal details. In some cases, they might ask you to pay some sort of fee via credit card. Once a scammer has your Social Security Number and any identifying information that they glean from the conversation, they can use it to create a fake identity. They then use that information to apply for credit card or bank loans, automobile financing, housing, jobs and government benefits. Even if you catch on and report the incident to authorities, the trail of fraud can follow you for years. Some people think they can change their Social Security Number to end the damage, but the fact is that the major credit bureaus link a new Social Security Number account back to the old one to prevent people from trying to erase their own history of bad credit and debt. The simplest way to protect yourself is to hang up the phone. Even if a person calling you seems legitimate, you can always call the Social Security Administration at 1-800-772-121 to confirm the identity of the person who called you. If you're expecting a call from someone specific, you already have their number and you're uncertain that you're speaking with the same person, tell them you need to call them right back, hang up and call the number that you have at hand. Some crooks will try to say that you can confirm their identity by calling them back at a number that they give you. Don't allow them to distract you with reasons to use a different number, such as they've recently switched offices and extensions. Report the incident to the Office of the Inspector General via phone at 1-800-269-0271 or online at https://oig.ssa.gov/report-fraud-waste-or-abuse. Always stay on top of the situation and keep a detailed written record of the people you contact, such as law enforcement, the real SSA, credit bureaus, financial institutions and other businesses, if applicable. Identity theft and fraud are so common today that it's important to keep in mind that you shouldn't allow criminals to win by obsessing over your situation if you become a victim. Identity theft doesn't often result in justice for victims because many thieves sell stolen data to others people who then use it. The best you can usually hope for is to halt the continued false actions in your name, ask the credit bureaus to flag new activities and prevent future events by following the outlined fraud protection tips.